Sprinkled throughout the Sierra Nevada and foothills are a number of covered bridges – two are the best-known and most accessible. Bridgeport and Knight's Ferry. 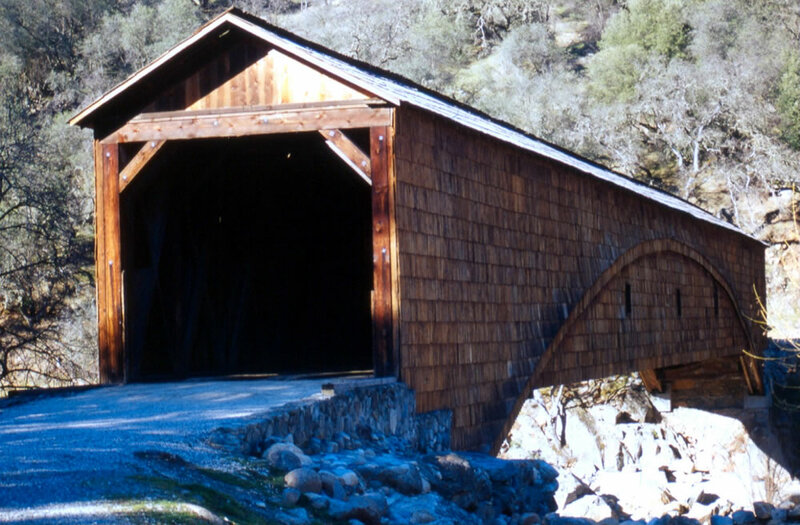 Strikingly rustic and situated in a picturesque river valley, Bridgeport is one of only ten covered bridges remaining in California. Built in 1862 by the aptly named David Wood, it is 251 feet along its ridge top — the longest single span covered bridge in the United States. It is both a California and National Historic Landmark. 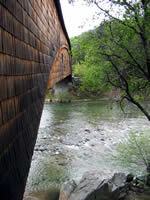 Constructed of local Douglas fir, the bridge is in the form of a Howe Truss with an auxiliary Burr Arch. The arch is fashioned from two 5” x 14” timbers bolted together with the truss members wedged between. Iron rods knit the structure together. 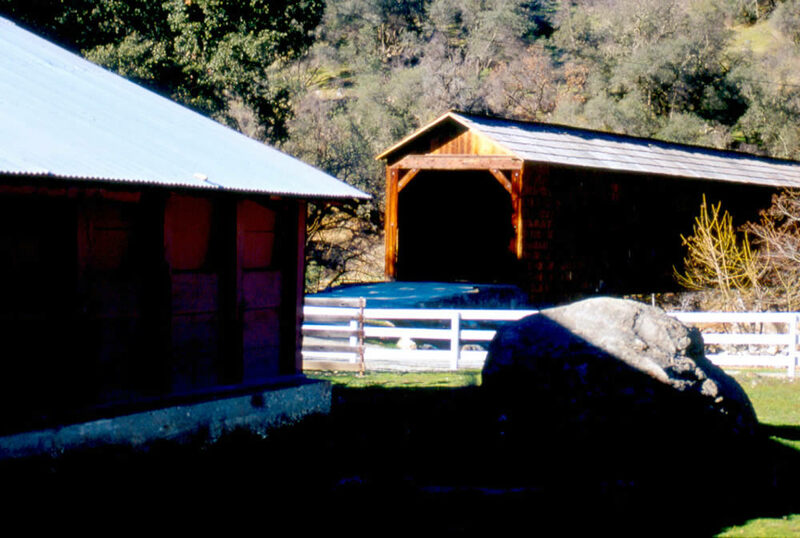 The covered bridge rests on two massive granite abutments. At one time, the bridge could support thirteen tons, but today it is rated at three tons because of its age. The outside of the span is covered with Sugar Pine shakes that protect the interior. Nowadays only foot traffic is allowed. In 1853, the California State Legislature authorized the formation of turnpike companies that could build and operate roads and bridges. … teams were lined up, one behind the other, waiting for traffic in the opposite direction to pass. From 1862 to 1901, Bridgeport was a privately owned toll road. In 1862, the tolls ranged from 5 cents for a hog to $6 for an eight-horse team. It earned $4000 – $5000 monthly in fees — an extraordinary amount in an era when $500 was considered a good annual income. 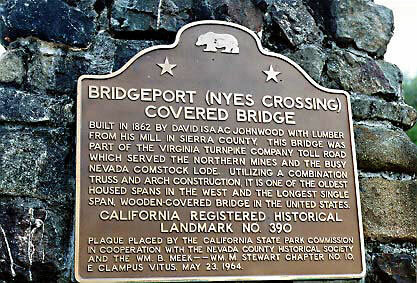 In 1901, the bridge became Nevada County property and no further tolls were charged. While other contemporary covered bridges washed away or deteriorated, Wood’s Bridgeport has withstood the ravages of high water and Father Time, although it did suffer $700,000 in damages during the devastating flood of early 1997. Acquired by the State of California in 1986, Bridgeport is now the centerpiece of the South Yuba River State Park, a 20-mile long crazy quilt of land along the Yuba River. 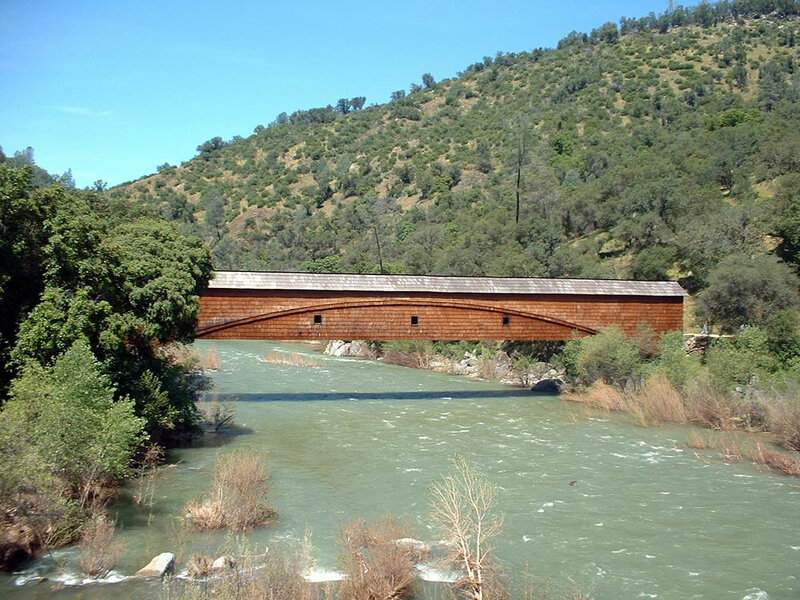 In addition to the covered bridge, the park boasts wildflower walks, a visitor center, gold panning demonstrations, living history and interpretive programs, and the South Yuba Independence Trail, the first wheelchair accessible wilderness trail in the United States. Bridgeport is both a California and National Historic Landmark. 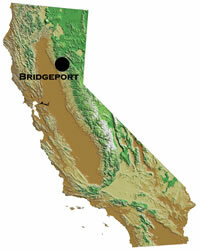 Bridgeport is located in the South Yuba River State Park. Nowadays only foot traffic is allowed on the covered bridge. Constructed of local Douglas fir, the bridge is in the form of a Howe Truss with an auxiliary Burr Arch. Built in 1862, Bridgeport is the longest single span covered bridge in the United States. As shown here, the bridge was heavily damaged during a devastating flood in early 1997. It has subsequently been repaired. The bridge sustained these damages during a 1997 flood. 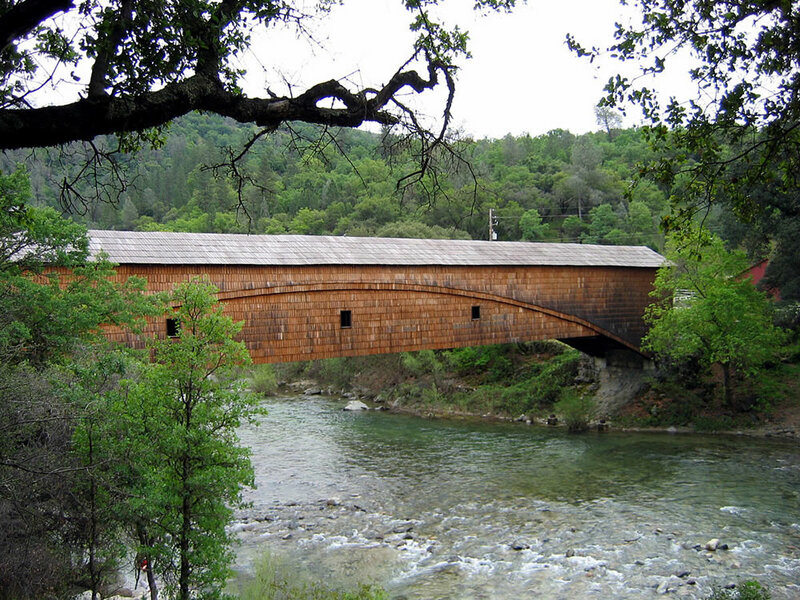 Bridgeport is one of only ten covered bridges remaining in California.